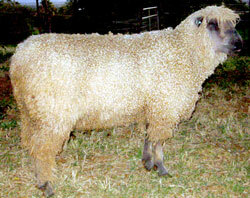 Yearling ewe before and after shearing. 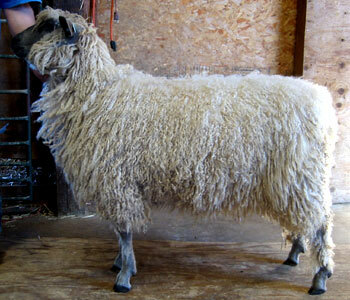 Note the good size, even fleece (uniform from shoulder to hip) and strong conformation. 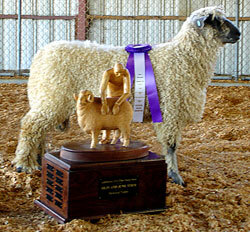 This lamb is a typical example of the flock – she has a striking presence, long level topline, strong pasterns, and stands square naturally. 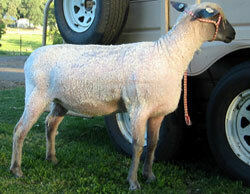 93% ram #623 pictured at 6 months and as a yearling. 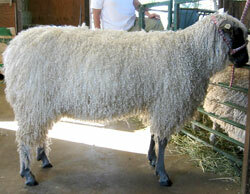 He has incredible luster and his 2008 lambs (both white and colored) have excellent conformation.